Duchenne muscular dystrophy (DMD) is a fatal, X-linked disease caused by mutations in the massive dystrophin gene that lead to extremely low or non-detectable levels of dystrophin. Conversely, Becker muscular dystrophy (BMD) is a highly variable and significantly less severe disease that results from truncated or poorly expressed dystrophin variants. 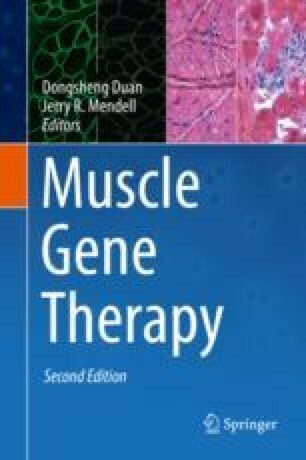 Based on the insights from BMD patient mutations and knowledge of the working domains of dystrophin, various miniaturized mini- and micro-dystrophin constructs have been developed for gene therapy and tested in preclinical animal models. Much of the central rod domain can be deleted with minimal loss of function, provided that spectrin-like repeats 16 and 17, which contain the neuronal nitric oxide synthase localization domain, are maintained. The N-terminal actin-binding domain and the C-terminal dystroglycan-binding domain (covering parts of “hinge 4” and the cysteine-rich domain) provide important functions and stability, while the function of the C-terminal domain appears redundant. While a range of viral vectors expressing these miniaturized genes have been utilized for DMD gene therapy, the recent focus has been on recombinant adeno-associated viral vectors (rAAV), which have now been tested extensively in mdx mouse and DMD dog models, and have own entered clinical trials. These vectors have shown significant improvement in the DMD pathology of mice and dogs, although complete correction has yet to be attained. Gene editing through exon-skipping oligonucleotides and CRISPR/Cas9 is also being developed, with varying success and a sense that both technologies are still in their infancy. While promising rAAV clinical trials have begun, there is still work to be done to advance the field of gene replacement for DMD. Authors Katrin Hollinger and Julie M. Crudele have contributed equally for this chapter. This work was supported by grants from the National Institutes of Health (HL122332 and AR065139). KH was supported by a fellowship from Solid Biosciences.